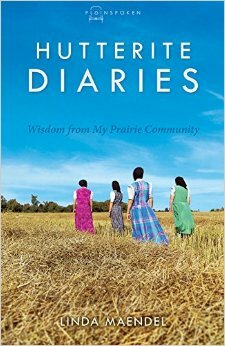 I accepted a copy of Hutterite Diaries : Wisdom from My Prairie Community through the Litfuse Publicity. I was curious to learn more about the Hutterite community and their beliefs and this seemed as good a time as any to read up on such matters. Author Linda Maendel was born to Hutterite parents and this way of life is all that she has ever known. Hutterite Diaries is a series of short essays on a variety of topics and stories all of which were born in her community. Maendel talks about Hutterite history and how her community came to be. She writes about harvesting potatoes, sharing community meals, what a typical wedding day looks like for the bride and groom, family heartache and life in her schoolroom where she teaches. This book acts as a sampler for Hutterite life and she wrote it to give people a more accurate pictures of what being a Hutterite really means. There is a uniform system of dress, with women wearing a sleeveless dress, blouse, apron and a head covering. The men wear casual dark jackets. As stated in the above quote, the Hutterities operate in communities where everything is shared. While each family (typically) would have its own house and would own the contents inside, should someone else in the community be in need of something, it would be shared. There seems to be a type of communal dining hall where all of the community food is stored and where everyone eats. Members of the community rotate turns cooking and cleaning. The children have their own separate dining hall where they eat together while they are young. At 18 years of age, the child becomes an adult and joins the adults in their own separate dining facility. Men and women sit on opposite sides of the dinner table and also on opposite sides of the church building during worship services. The Hutterites are striving to live according to Biblical commands, of course, although I think they miss the mark quite well in spots. Their desire is to live simply, sharing with other believers and to not be conformed to this world. I do not think that their desires are bad, but that their understanding of scripture is unbalanced. We are not to be conformed to the behaviors and customs in the way that the world thinks but are to be renewed in thought to think more as Christ would have us think. There is a distinction to be made. We are in the world but our thought patterns should not follow those which are generally held to by the world. It's important to note that Jesus sent us into this world to live in it. (See John 17:18 for convincing. Actually, see all of John 17. ) We Christians are sent into the world to share the Gospel with others. This is hard to do when you seclude yourselves into little sects. This is also an argument worthy of another post but I absolutely cannot write up a review of this book without stating the ways in which I disagree with the author and these communities in general. I can't agree with the idea that we must sequester ourselves and share only with those who are like us. I think the verse Maendel references (Acts 4:32) shows the heart attitude we are all to have and should be practically applied whenever we see opportunity. At the same time, you can't just look at that one verse in scripture while ignoring others. There are plenty of verses in Proverbs which suggest that those who like to eat (and have clothes and drive cars) are called to work. Laziness isn't something to tolerate. From the way Maendel describes life in the Hutterite community, everyone pitches in and helps out, but she does not go in to how the community reacts to laziness. And I have to think but that laziness exists. I just didn't feel like she explained very well how this whole "everyone works for everyone and shares in everything" thing plays out. If you want me to "buy" the idea that this is a good system, I would need to be convinced with the whole of scripture and not just one or two selected verses. Least I give off the wrong impression here, I don't really have a huge problem with sharing your possessions in a community setting or dressing to hide your ankles. I do think that that is overly legalistic and that scriptures in no way requires this of us. I have never been nor ever will be a fan of people cloistering themselves into small communities, fellowshipping only with those inside of this same pre-arranged/pre-approved group. I suppose it does give an illusion of safety in certain respects and that is what makes the idea tempting to we humans. We naturally want to be with people who agree with us and whom we find agreeable. However, I think great caution should be applied to any group or system which requires more of you than the Scriptures themselves. I think the Hutterites mean well but cross the line into legalism and that gives me pause. Christ didn't tell us to go forth into all of the world and establish communities of our choosing. He himself mixed with a great many different and sinful people when He came to earth; He is our example in how we are also to live in this world. To put it another way: it's sort of easy to love people who are exactly like you. It's very difficult to love those who are not. A Hutterite community seems an easy one to share life with if you feel as they do. However, I think the better challenge and more correct challenge is to be in the world and not to ask for and/or to scheme to be taken out of it (John 17:15). Our prayers instead should be for strength and grace and to be kept safe from the evil one who seeks to destroy. I can say of this book that I appreciated understanding the Hutterite belief system a little bit better. I can say that Maendel seems like a very pleasant gal whom I would delight in being friends with, were we to ever meet. I must also say though that this book did nothing to persuade me that the Hutterite's apply the whole of scripture to their daily life. I think they've picked and chosen some favorite verses and are trying to live those out. While it is always good to strive to obey Scriptures, it is equally important that you look at the whole and not just a part when doing so. To look at only a snippet and base a life around it is a road often fraught with danger. I am thankful to Litfuse Publicity for allowing me to participate on this blog tour. To check out others' opinions of this book, visit the Litfuse Hutterite Diaries landing page. I wasn't familiar with the term Hutterite until seeing this listed on your Nightstand post. It was interesting to learn more about them. I agree about needing more than one verse to base a whole manner of life on. Context matters, too: in Acts, the believers were under persecution, some had probably lost homes and jobs, so caring for each other that way was a necessary part of ministering to the body. There is also a difference between a part of the Bible that is given as a command, and a part that is telling us what people did historically. Having "all things common" is not a command, though what they did in Acts was an excellent outpouring of ministering to each other, truly counting what they had as not their own but to be used for others. I agree, too, that they take the whole concept of "separating" from "the world" and other concepts way beyond their Biblical moorings. This was a very interesting review. I have heard of Hutterites, but didn't know exactly who they were. I think I would enjoy reading this book; I'll keep an eye out for it. I agree with your view; as Christians we should try to live out all of Scripture. Follow Jesus, not manmade rules. Thanks for reviewing this and providing some food for thought! Bekah - Yes! I agree. I very much agree with Carrie on her perspective of the book and author. Many times I have seriously considered joining the Hutterites in either North Dakota or Montana. The one simple commandment our Lord Jesus gave us was to go tell someone of the good news. Many of the Hutterites never leave the farm. Only a few certain elderly deacons in Canada are allowed to read a newspaper. Very few of them have no clue how close we are to the coming of Christ and how important it is to get out and witness to others. They'll never know.